The New Britain Bees picnic area is the perfect place to enjoy a fully catered outing with friends, family or co-workers at New Britain Stadium. Picnics start 30 minutes before the game and food is served until one hour following first pitch. Fans can relax underneath an expanse party tent, enjoy an excellent food and drink menu, and also take in the game from a premium field box seat. All guests will be treated to an all-you-can-eat buffet including hot dogs, hamburgers, grilled chicken, chips, soft drinks, water, and cookies. After the picnic has concluded, all participants will then take their seats together to enjoy the rest of the night's entertainment. Groups will have the thrill of being recognized over the PA system as well as the Bee Vision scoreboard during the game. Groups can book a picnic with a minimum of 25 guests or exclusively reserve this entire area with a minimum 300-person group. This all-you-can-eat picnic options costs $25 per person, and $20 for children 12 and under. For more information about booking a group outing, please stop by the New Britain Stadium Box Office, call (860) 860-BEES or visit www.nbbees.com. 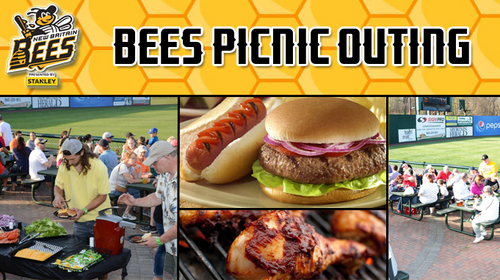 CLICK HERE to view all of the group outing opportunities the Bees have to offer.